Make more by selling with us! ...<10 days later you get a check in your mailbox! Make the most for your outgrown children’s items! Set your own prices and let us handle the selling! Consignors earn 65%-75% of their sold items’ prices. We charge a consignor fee between $5-$15, which is deducted from your check after the sale. To maximize your payout and minimize your fees, sign up to help out at the sale! Download full consignor details here. Our Consignors also get to shop a special pre-sale before we open to the public! Helping out at the sale as a Volunteer Team Member has some great perks! Shop before we open. The more you volunteer, the earlier you shop. Sign up for the event to see available shifts. Another way to help at the sale is to complete a barter. The maximum earnings through barters is 70% and $5 off the consignor fee. You may drop off anytime during the drop off timeframe that is convenient for you. You may have a friend or family member drop off on your behalf. 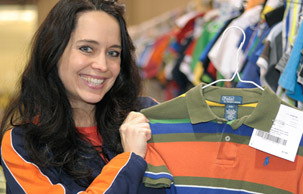 For smoothest drop off, have clothing items sorted by gender & size and other items sorted by type before you arrive. All clothing must be on hangers in accordance with our item preparation guidelines. Please plan to be finished dropping off by 7:00pm. An average consignor can drop off in about 20 minutes. If you have a high volume of items (200+) please plan to arrive more than 90 minutes before the end of drop off. You may pick up your unsold items or have a friend or family member pick up on your behalf. You may also have us donate them to a charity partner on your behalf and provide you with a tax receipt. After pickup, all leftover items will be donated to one of our charity partners. Sorry, no exceptions. Package: Please zip-tie items to an adult-size hanger. If you would like to place high-priced items (over $25) in our High Value Area near Checkout, please see a volunteer at Drop Off for assistance. Package: Use clear, self-seal bags or clear cling wrap (saran wrap) to hold multiple items together; Tie sets of books together with ribbon/string. Be sure that parts/games to video game systems (such as Vtech) cannot be separated or switched out at the sale. Video games will be placed near checkout to prevent theft. We sell children's clothing Newborn through Juniors as well as Maternity/Nursing. Be picky! Please bring ONLY THE VERY BEST. Items must be very clean and free of any staining or damage. Damaged or stained items will not be accepted at drop off. Please keep items IN SEASON and in style. Save yourself time/effort by not tagging things that won’t sell well. Please be choosy on Juniors items and stick to more popular Juniors brands: Abercrombie, Hollister, Roxy, American Eagle, Nike, Volcom, Burton, etc. Please also be extra choosy on maternity clothing. Be sure the style is current and they’re in great shape. Please freshly clean your clothing items. Replace missing buttons, sew loose hems and seams, and clip loose threads. Please button all buttons, snap all snaps, zip all zippers before you arrive at drop off. This will ensure that there are no defects in the clothing. The newer the item looks (and the better it smells), the better it will sell. That means more money for you! Package & Hang: Hangers - Please hang clothes so the hanger hook points to the left (like a question mark). Hang size 0-6 clothing on child-size hangers and sizes 7-20 and maternity clothing on adult-size hangers. Clothing that falls off the hanger onto the floor does not sell well. Old Navy and many outlet stores are great places to get free hangers (they throw away hangers daily!) and WalMart & Target sell child-size plastic tube hangers at a great price. Clothing Sets - Sets tend to sell better (under size 5) so match things up if you can. All garments should be hung with the hanger hook pointing left (hanger should resemble a question mark when looking at the front of item). Safety pin or use a tagging gun to attach clothing sets securely with bottom garment hung on the backside of the shirt, so both pieces can be viewed without separating them. Pants/Shorts - Pant-clip hangers are great but if you use a standard hanger, simply use your tagging gun to attach pants to the top part of the hanger so the garment will not slide around. Socks, tights, hats and infant mittens need to be in a clear zip-lock bag (you may group multiple items in one bag). Please be sure to label your tag well so that customers know what they’re buying. Please do not tape these bags closed because buyers will want to inspect what they’re buying. Price: Hanging Clothing - Put outfits/set together to price for at least $3.00; Start at $3 for basic, generic brand 0-24mo outfit. Add $1 each for larger size, name brand, formal, and heavy/winter. For very special high-end or boutique brands, price between 30%-50% of the retail price depending on age and condition. Tag: Clothing on Hangers - Attach tag with a tagging gun or safety pin to the upper right front of clothing. Insert the gun in a label or inside seam NOT through part of the clothing (to avoid making a hole or tear in the clothing). Also, pull on the tag to make sure it is properly secured and will not come off easily. Please make sure consignor tags are pulled out of the clothing so they are easily visible to the customers. View our helpful tagging videos if you'd like to see how it's done. Exersaucers, swings, high chairs, changing tables, cribs (Manufactured AFTER June 28, 2011; please bring Crib Waiver (link) for all cribs), strollers, bath seats, baby walkers, car seats & car seat accessories must be checked for safety recalls, must have all parts, and be in good condition. Children's furniture - beds (toddler, twin), desks, side tables, dressers, etc. Price: Shoes must be in very good condition and should start at $3.00 for infant/toddler; Add $1 each for larger size, name brand, or heavy/winter. Clean all toys and baby equipment thoroughly. Please test to make sure that toys and equipment are working properly. 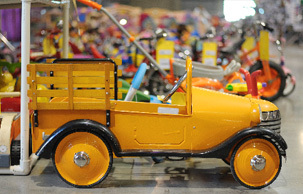 Battery operated toys must include working batteries (these can be purchased inexpensively at local discount stores). Tag: Attach JBF tag directly to item with clear packaging tape or hole-punch JBF tag and tie it to item. Check out our tagging videos for a helpful demonstration.